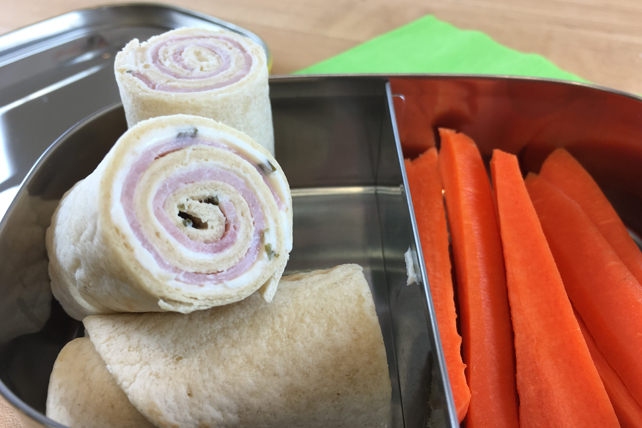 Prepare these simple, yet oh so tasty, roll-ups to serve as part of your kids' lunches. Cutting the sandwiches into small pieces makes them easy for small hands to pick up and enjoy. Tell the kids that you're making these fun tortilla sandwiches and watch the smiles appear. Spread tortillas with cream cheese product. Top with ham; roll up. Cut each roll-up into 3 pieces. For a meatless version, substitute 1/4 cup of your kid's favourite variety of Cracker Barrel Shredded Cheese for the 2 ham slices.